I think it was in 2005. I was looking around for some sort of hardware component Timer to track Podcast recording session elapsed time. I came across an Ad in Radio Magazine sponsored by ESE. They specialize in manufacturing different types of clocks, timers, and timecode utilities intended for broadcast environments. It was their Up Timer (designed to track live programs and air time) that sparked my interest. The device originally retailed for (I think?) $300. Functionality is straightforward: LED display – Start, Stop. Reset buttons, and a DB9 interface for remote control operation. Interestingly – it is limited to a 60 min. ceiling. Actually, it’s range was/is 00:00 – 59:59. Below is a snapshot of the current (desktop) model. It retails for less than $200. Anyway, shortly after my initial discovery of the device, I decided to build a software version for the Mac. Version 2 was released in 2011. Seven years later I am releasing Version 3. Besides the noticeable UI redesign, the application is now 64bit. * The ceiling is somewhat flexible, thus allowing the user to select either a 60 or 90 min. ceiling. 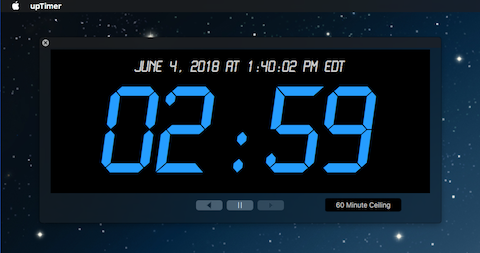 * The upTimer font color can be set to blue or yellow. The font color shifts to red when the elapsed time reaches the 2 min. mark relative to the defined ceiling. * The operation keys (Reset, Stop, Start) are mapped to ←, ↓, → keyboard keys respectively. * The application window checks in at approx. 735 x 340 pixels. I plan to add scalability to the UI sometime in the future. Note in this version I decided to include and display a running long form Date and Time string above the upTimer. The user can hide it’s visibility, along with the linked ceiling setting indicator. Update: Version 3.5 includes a new UI size display preference. The Large option resizes the application window by approx. 40%. Update: Version 3.5.1 includes Application Menu actions with mapped keyboard shortcuts to toggle the display size of the UI. Update: Version 3.5.2 mainly includes UI tweaks. Fee? None. My only request is to please keep me in mind for expert Podcast Audio Post, audio processing, and consulting. I’ve been in the space since 2004.